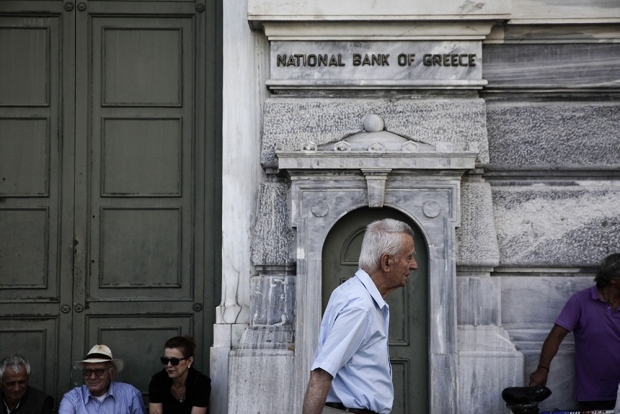 After Greece announced that banks would be shut for a week, pensioners waited outside a National Bank of Greece branch on June 29. The government pleaded for calm after citizens emptied cash machines in a dramatic escalation of the country's debt crisis. China’s main market, reflected in the Shanghai Composite Index, has fallen 24 percent since June 12, losing $2.4 trillion in value. While many analysts are focused on the financial crisis in Greece, some are beginning to wonder if China's woes may have a greater affect in the long run. China’s equity market should matter to the rest of the world but thus far it has been a relatively minor factor. It should matter since it is now the second largest in terms of market capitalization and the largest by daily trading volume. But because China’s capital markets still are controlled, their impact on global markets is limited. Nevertheless the links with the rest of the world have strengthened over time and the repercussions of what is happening in China can no longer be ignored. Thus the big question is whether China is at the verge of an equity collapse or it can defy normal measures of value and continue to track upwards. By western market norms, equity prices are way too high in relation of earnings, raising the likelihood of a continued economic slowdown. Most western analysts predict a sharp retrenchment—and see the recent sell-offs as evidence. Yet others have noted that the surge over the past year—when general economic indicators have tracked downwards—is largely policy driven, meaning that investors are betting on the Government’s intention to support a stronger equity market to reduce debt burdens for corporates and drive GDP growth. Those who place such strong faith in policy-driven markets may be disappointed, but the pessimists may be missing a stronger force for higher equity values. Historical evidence has shown that countries moving to more liberalized financial systems usually experience a long-term run-up in equity prices. This is all the more likely to happen because China’s interest rates are too high relative to the other major economies and will be likely to gravitate downwards over the coming years. Which factors will win out is anyone’s guess but one thing is certain: extreme volatility. China’s economy has slowed substantially, in part due to huge excess capacity in heavy industry and property, itself the result of a big accumulation of debt. As monetary policy is eased, boosting credit market activity, it is not necessarily leading to increased investment. Rather, it is boosting asset prices, including equity prices. Indeed the surge in equity prices over the past year was, in part, fueled by an increase in margin debt. One can argue as to whether or not equity prices are overvalued. But if prices should fall substantially, and indeed they have begun to fall, it could have a negative impact on consumer wealth and on the health of financial institutions that funded the purchase of equities. In fact, the Financial Times reports that there has been a surge in defaults on margin loans. Yukon is right, however, that there are arguments supporting a further increase in equity prices. It is true that Chinese interest rates remain relatively high. Thus, the central bank has plenty of room to ease policy further, especially in the context of a low inflation environment. As to the rest of the world, China’s economy has a massive footprint on the global stage. Any event, such as an equity market collapse, that influences consumer or business spending, is likely to spill over onto the global economy. Already, the halving of China’s growth has wreaked havoc with global commodity markets and has negatively influenced growth in those East Asian economies that are a vital part of China’s manufacturing supply chain. It could be argued that the imbalances in China’s economy thus represent more of a risk to the global economy than the current and much discussed situation in Greece. This question is very interesting and timely since the Chinese stock market has declined by around 30 percent in the past three weeks. In my view, the Chinese stock market could matter to the rest of world if the Chinese stock market had a contagious effect in other markets, or if the market movement told us something about the health of Chinese economy, or if the market movement itself could affect the Chinese economy. But none of the three seems to be true so the impact is very limited. If the Chinese stock market were highly integrated with the global markets and accounted for a meaningful share of global investment portfolio, or if Chinese investors had a large holding in other stock markets, a sudden correction could lead to a broader correction in other markets. However, as Yukon Huang has correctly pointed out, the Chinese equity market is still rather closed. The stock market is still dominated by domestic retail investors and foreign investors only have a tiny 2 percent holding. Chinese investors also have very limited holding of global financial assets except the official foreign reserve, so a market correction in China would be minimally contagious to the rest of world. Although the Chinese stock market is rather isolated from the rest of world, it could still have an impact if market movement indicated the health of Chinese economy. If the stock market were to collapse because the Chinese economy slowed down faster than expected, that could have a big impact on the rest of world because China is the second largest economy in the world and is the top trading partner of more than 100 countries. But it seems that the stock market has had little to do with the economy’s fundamentals, at least in the past 12 months. The economy was slowing down when the market went up by more than 100% and, although the market lost around 30 percent in three weeks, the economy is actually showing signs of stabilization as industrial value-added business and property sales are rebounding. The stock market correction may not hurt the economy much either, just as a stock market rally won’t show much benefit. Equity financing is only 5% of aggregate financing in China, so it is quite marginal. Only 50 million Chinese people have stock holdings and the overall value they hold is worth about RMB 13 trillion, which is less than 5% of Chinese household assets—they have RMB 50 trillion as bank deposits and properties held are worth more than RMB 150 trillion. One possible impact is that companies that bought into the market at its peak will see losses affect their profits negatively, but there is no evidence yet that these will be catastrophic. The other impact is probably on accounting as the growth of the financial service industry could slow down and it make less of a contribution to overall GDP growth. Taken together, the Chinese stock market still means very little to the rest of world.